Scots Magazine December 2017 – Out in Shops Now! We got a new cleaner in September. You may ask what has this to do with Christmas? Like most house proud or paranoid housewives we did the deep clean before the cleaner starts. Be honest you’ve all been there or is it just an Edinburgh thing? While the house felt like Christmas once we were sparkly and tidy the bin felt like Christmas too – huge piles of paper and rubbish and all of last years stocking fillers which I had bought from a noteworthy Poundshop to fill up a large red sack that Santa had brought all the way down the chimney. Despite the looks of awe when the red sack is unpacked, I now think it’s all an act to make me feel valued, never again – my children have officially grown out of the Santa sack. I’m writing to Father Christmas once I’ve finished this to make sure he gets the message. This year it will be a cheque, to be spent as they wish with the obligatory new pajamas, socks, pants and a selection box. I can’t go wrong with any of that and it won’t take me until the following Autumn to bin it all. As for the food I’ve learnt how not to bin anything. Home made pasta of course, as no real Italian family has ever been known to waste homemades when so much time and love is needed to knead, roll, cut and cook the delicious sugo to go with them. I now cook a turkey crown as none of the family like the brown meat from the bird so no waste there. All the trimmings are counted and only the favourites are cooked: dauphinoise, creamy carrots, piggies in blankets of course, traditional stuffing with thyme and apricots, sprouts with chestnuts and parsley breadcrumb peppers. All perfect for re heats even three days later. The only problem area we have is dessert. Trifle – I love but it’s just me. The children love ice cream so a trip to Lucas to keep the freezer filled never goes wrong. But Christmas wouldn’t be christmas without Christmas pudding so I make a tiny one that Victor can happily finish on his own. The one thing that I can’t not make is Christmas cake. 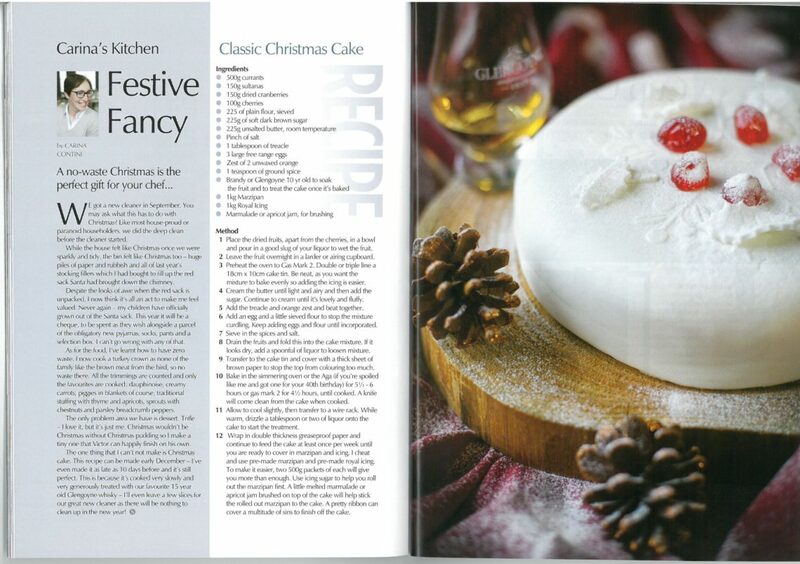 This recipe can be made early December, I’ve even made it as late as 10 days before and it’s still perfect as it’s cooked very slowly and very generously treated with our favourite 15 yo Glengoyne whisky – I’ll even leave a few slices for our great new cleaners as they’ll have nothing to clean up in the new year! 1. Place all the dried fruits, not the cherries, in a large bowl and pour a really good slug of brandy to wet the fruit. 3. Double or triple line a 18cm x 10 cm cake tin. Be as neat as possible as you want the mixture to sit neatly in and bake evenly so when you come to marzipan and ice the cake it’s easier. I always make this recipe entirely by hand as I feel it’s the best way to keep the fruit from breaking up and bursting. Choose a big old fashioned grannies baking bowl or pot if you don’t have one big enough. The butter has to be at room temperature or it will be too difficult to cream. Cream the butter until light and airy and then add the sugar. Continue to cream until it’s lovely and fluffy. Sieve in the spices and salt. Transfer to the cake tin and cover with a thick sheet of brown paper to stop the top from colouring too much. Bake in the simmering oven of the Aga (if you’re spoiled like me and got one for her 40th birthday) for 51/2 – 6 hours or gas mark 2 for 4 ½ hours until the cake is cooked. A knife will come clean from the cake when cooked. Allow to cool slightly then transfer to a wire rack. While warm drizzle a tablespoon or two of whisky onto the cake to start the treatment. Wrap in double thickness greaseproof paper and continue to treat the cake at least once per week until you are ready to cover in marzipan and icing. I cheat and use pre make marzipan and pre made royal icing. To make it easier you two 500g packets of each will give you more than enough to adequately cover the cake top and around the side. Use icing sugar to help you roll out the marzipan first. A little melted marmalade or apricot jam brushed on top of the cake to help stick the rolled out marzipan to the cake. The marmalade will also help the icing stick to the icing. A pretty ribbon can cover a multitude of sins to finish off the cake.